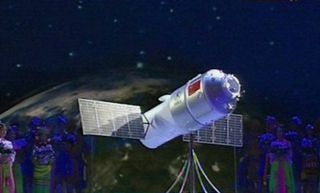 The first public appearance of China's space station concept. STRASBOURG, France — China is ready to carry out a multiphase construction program that leads to a large space station around 2020. As a prelude to building that facility, China is set to loft the Tiangong-1 module this year as a platform to help master key rendezvous and docking technologies. During the projected one- to two-year lifetime of Tiangong-1 — which means “Heavenly Palace” in Chinese — an unpiloted Chinese Shenzhou-8 spacecraft will first attempt to dock with the platform, to be followed later by two piloted Shezhou missions to further hone rendezvous and docking skills. This graphic from a China Astronaut Training Center presentation depicts a Chinese Shenzhou spacecraft docked at the country's first space station module Tiangong-1. China’s rendezvous and docking (RVD) project is the next goal of China’s manned space program, said Jiang Guohua, a professor and chief engineer at the China Astronaut Research and Training Center in Beijing. Jiang outlined China’s space station efforts here at the 15th annual International Space University symposium, titled The International Space Station: Maximizing the Return from Extended Operations. China formally began its space station program in October of last year, Jiang said, an initiative that aims to complete the construction of a “relatively large” manned space station around 2020. “Today, the RVD project is smoothly going through technical preparations and testing,” Jiang said. “Shenzhou-8 will be launched in October of this year,” with the two piloted missions to be launched in 2012, he said. Tiangong-1 weighs about 9 metric tons (8,500 kilograms) and is some 35 feet (10.5 meters) in length and a little over 11 feet (3.4 meters) in maximum diameter. It consists of a laboratory module, resource module and docking mechanism, Jiang said. China’s next step is a space laboratory phase, he said. Two space laboratories — the Tiangong-2 and the Tiangong-3 — will be developed and launched, focused on breakthroughs in key technologies needed to build a larger space station that provides long-term living conditions for astronauts. This graphic from a China Astronaut Training Center presentation depicts China's planned space station. Placed into orbit in 2013, the Tiangong-2 will offer three astronauts about 20 days of living conditions. Tiangong-3, to be launched two years later, is being designed to support a trio of astronauts for about 40 days, with an assignment to examine regenerative life-support technology, as well as to verify technologies of orbital replenishment of propellant and air. Lessons learned from the space laboratory stage will lead to a space station phase, with this complex consisting of the Core Cabin Module (CCM), the Laboratory Cabin Module 1 (LCM-1), a Cabin Laboratory Module II (LCM-2), along with a Shenzhou-manned vessel and a Shenzhou cargo craft. To be assembled in the 2020-2022 time period, this large orbital station will weigh about 60 tons, Jiang said, with a design lifetime of about 10 years. The complex will usually support three astronauts for long-term habitation, he noted. Jiang said that a rich agenda of research is planned for China’s space station, from conducting microgravity science to space radiation biology, as well as astronomy and testing of a deployable antenna. Additionally, Jiang said that China has started development of more powerful carrier rockets, including the building of a new launch center in Hainan Province. Regarding space cooperation, Jiang said China intends to strengthen exchanges with other countries in the field of space science research and applications. He explained that the rendezvous and docking project hardware is compatible with the International Space Station. Jiang also spotlighted Wang Yue, an instructor at the China Astronaut Research and Training Center. Wang is one of the six crew members for the Mars-500 international experiment now under way in Moscow — a simulated Red Planet expedition testing the human physical and psychological strains on a 500-day journey to Mars.